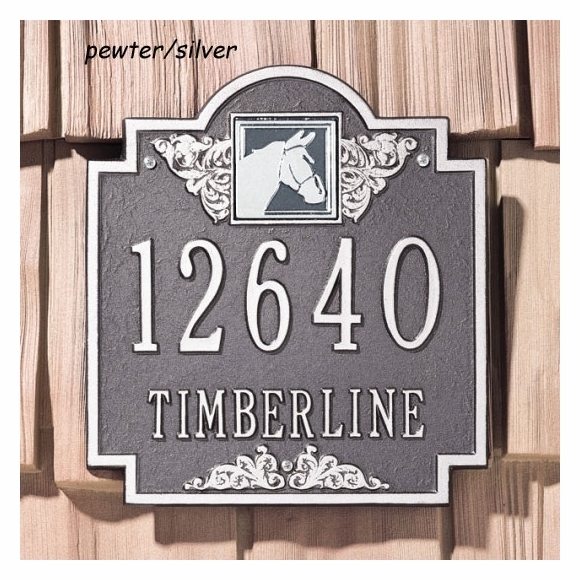 Personalized Address Plaque with Horse - - horse theme address sign for equestrians and all horse lovers. Made in USA. Wall mount address sign with a horse head pictured at the top. The one-line version holds up to five 3" characters or twelve (12) 1.25" characters. up to twelve (12) 1.25" characters on line 1 and up to five 3" characters on line 2. Note: The maximum overall total for a 2-line plaque is 17 characters (up to 5 on one line and 12 on the other). Color combinations: pewter with silver characters; green with gold characters; bronze with gold characters; black with gold characters; antique copper. Personalized address plaque with horse head and decorative accents. Made in USA.